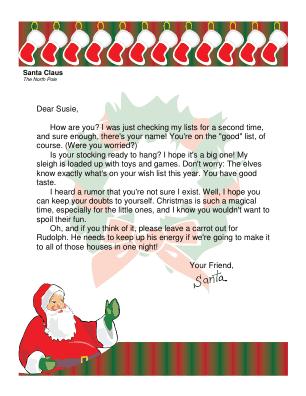 When children start to question whether Santa Claus is real, this letter can help reassure them, or at least keep them from telling their siblings. Is your stocking ready to hang? I hope it's a big one! My sleigh is loaded up with toys and games. Don't worry: The elves know exactly what's on your wish list this year. You have good taste. I heard a rumor that you're not sure I exist. Well, I hope you can keep your doubts to yourself. Christmas is such a magical time, especially for the little ones, and I know you wouldn't want to spoil their fun. Oh, and if you think of it, please leave a carrot out for Rudolph. He needs to keep up his energy if we're going to make it to all of those houses in one night!